My Rating: 3 stars? I don't even freaking know. "What if life could be this way? Only the happy parts, none of the terrible, not even the mildly unpleasant. What if we could just cut out the bad and keep the good? This is what I want to do with Violet- give her only the good, keep away the bad, so that good is all we ever have around us." I honestly don't know where to begin this review and I was really hesitant to even write one. It is a beautifully written book and I really enjoyed it for the most part. I knew going in it would have sensitive subject matter and I even read the ending prior to starting. So, one would think I was prepared. Uh, NO. I was not prepared and now I am NOT okay either. Upon finishing this one, I felt so many emotions: heartbreak, grief, anger, and loss. So, so much loss. For Violet, for Finch, for their friends and families, and for myself. Violet and Finch do not have the most conventional meeting. The novel opens with both of them atop the bell tower at school, contemplating putting an end to their lives. Fate brings them together and I could see the makings of a great love story coming out of this one. Finch is labeled as a freak, has very few friends, and has quite the existential outlook. Violet is the extreme opposite. However, Finch works his way into her life with his quirky humor and his unwillingness to let her go on as if the incident at the bell tower never happened. The two partner up on a geography project and I absolutely loved the idea of it. Discovering the natural wonders of the state, as well as a deeper meaning to life and existence all while spending time with someone you never thought you would. EPIC. Violet is a broken shell of a girl at the beginning of this book and we get to see her really come alive and it's pretty much due to Finch's influence. I liked Finch a lot. He is funny and witty and I just adored his interactions with Violet. We are kept in the dark for most of the book as to what's going on with him and when it all comes to light, I wanted to throw things. But most of all, I wanted to throttle his parents for being the way they were. Violet was a bit hard to like at first. She just didn't have a lot of depth and part of that is due to her grief. However, watching her open herself up to Finch and let herself start to feel again was what really made her character better for me. I ended up really loving her in the end. Even with the way the two main characters meet, I didn't feel this oppressive, overwhelming feeling. 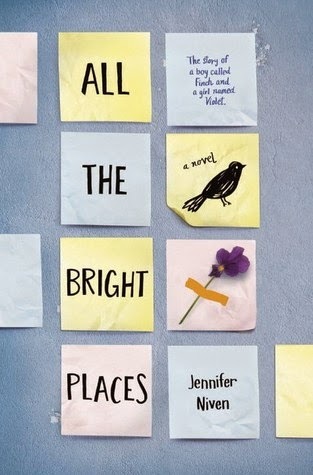 For a good portion of the book, it was hopeful and optimistic and I loved watching Violet fall for Finch. The book grew darker and as I read, I got that suffocating feeling and I started reading with trepidation. I felt the book tried to end on a hopeful note, but I couldn't get past the darkness to bring myself to that point. I can appreciate this book for the beauty that it offers and I understand the message the author was trying to convey to her readers. My heart just couldn't take it and I am incredibly saddened by that fact. Be prepared Alena! It's definitely a hard to read one! I was torn on this book too. I loved it but I hated it. Right? It was so beautifully written! I guess I just didn't want it to turn out the way it did. Thanks Zoe! I agree! It was hard to rate this one! I think I rated it lower just because I couldn't see the justification in what happened. LOL. You're not dead inside. It just didn't impact you! I just couldn't deal with what happened when all was said and done. Well color me intrigued. I have a feeling about this book - and even though I'll probably regret it, I want to read it. Haha. If you do, you'll have to let me know if I'm crazy for being super pissed off. Now I don't know if I should read this book. I love emotional books and it sounds wonderful, but... maybe I end up like you not taking it. I don't feel like getting my heart broken right now, that's maybe why I'm so into contemporary books in the moment. They usually leave you feeling all light and cheery. Melissa, I was so torn over this one. When it was over, I just wanted to throw my Nook across the room and pout. It's not that I'm against emotional books, but I don't know. I felt like it just went in a direction I couldn't get behind, if that makes sense? Not for me. I'm not even a spoiler person but I looked up spoilers and then read a spoiler review and NOPE. nope nope nope. LOL. Yeah. It made me too upset. I could not even deal. I don't think this book is for me. I just don't like sad books like this. They make me so unhappy and I don't know, I need my HEAs. I know this book really hit you hard, but I'm glad you were able to appreciate the characters and the writing at least, Jessica. I hope you read something beyond amazing to fill up the hole that this one created! I agree Nick. I needed a HEA with this one. Desperately. I know that's not always realistic, but... I would have stayed away had I known just how much it was going to affect me. 'The book grew darker and as I read, I got that suffocating feeling and I started reading with trepidation. I felt the book tried to end on a hopeful note, but I couldn't get past the darkness to bring myself to that point' ≤≤ this was literally me. I was so depressed after finishing this book and felt this odd kind of melancholy that lasted for days after. It was weird and . . . unpleasant, really. It just hit me like a ton of bricks and it took me a while to snap out of it! Yes! Allie! You hit it right on the head with that! It was an unpleasant feeling! I didn't expect to feel as emotionally attached to the characters as I did, so I think that's what really made it worse for me. I almost picked this up at B&N right after release, but after seeing so many reviews alluding to heartbreak, I read the ending in the store. I knew at that point that it wasn't the book for me. Maybe one day... but probably not. I read the ending too Kim! I don't know what I was thinking in reading it. After I saw the end, I should've just let the library book expire and move on with my life. Yeah I'm not sure if this one is for me because it just sounds that it might break me and I think I know where it's going and I don't think I could handle that. I can appreciate a story like this and know a ton of people will love it, but I don't think its for me. Great review! I'm all for emotional books, don't get me wrong, but with the content of this one, I guess I just needed it to be more hopeful. Violet had already gone through so much, so to add more for her... just didn't work for me. I LOVED this book, but I can totally see how it could just make you miserable and how some people might have a really hard time with it. This is one of those books that's going to affect each person differently. You did? I can totally see people loving it though. It's so beautifully written. I guess I just needed what happened NOT to happen if that makes sense. I wanted a more hopeful end. Thanks Rachel. I agree with it being overhyped. I should have known better than to read it after reading the end, but I wanted to find out why it ended that way. Not the smartest idea I've had. LOL.